Any coach will tell you that it’s not about how you start, but how you finish. They will also say that if you can control your own destiny, there’s not much more you can ask for. That’s exactly the case with the Colorado Buffaloes, thanks to a four-game winning streak from head coach Mike MacIntyre and his herd (8-2 overall, 6-1 conference), including three victories against teams from the Pac-12 South. The No. 12 team in the latest AP and Coaches Poll (they should be even higher in Tuesday’s College Football Playoff Rankings), the Colorado Buffaloes will need a bunch of luck and massive chaos to make that happen, similar to what happened last weekend when the No. 2, 3, 4 and 9 teams all fell. Even then, though, the Buffaloes will have to do their job by not only winning the Pac-12 South, but the Pac-12, which would mean beating three ranked opponents in three weeks — Washington State, Utah and (most likely) Washington. One slip-up and the dream is gone. 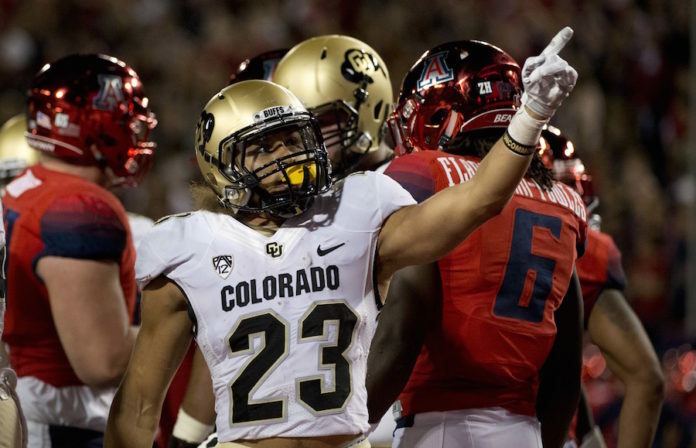 On Saturday, the Buffs host a stubborn bunch in No.23 Washington State Cougars (8-2). Washington State has the ball rolling after an 0-2 start to the season and have now won eight straight. At 7-0 in conference play for the first time in program history, the Cougars have their eyes set on winning the division. Quarterback Luke Falk has found his own, as he has been picking defenses apart. He has completed 73.9 percent of his passes for 3,610 yards and 33 touchdowns. He is coming off a great game where he threw five touchdowns passes, including three to River Cracraft, who will miss the rest of the season with a torn ACL. The Cougars also had over 200 yards on the ground, so Falk and Washington State hope to bring their newfound running game to Folsom in an effort to subdue the Buffs’ tenacious secondary. After that, they have what could be the most important game they’ve played in over a decade, as they’ll host the No. 15 Utah Utes (8-2, 5-2 conference). If they beat Oregon this weekend, Utah will come into Boulder understanding that if they take down the Buffs, the South is theirs. So both teams have a lot to play for. The Utes have won four of their last five games and are currently third in the Pac-12 standings. Their offense is averaging 31.2 points, 212.9 rushing yards and 220.8 passing yards per game. Their quarterback, Troy Williams, is completing 54.9 percent of his passes and has thrown for 2,184 yards with 13 touchdowns. Their running back, Joe Williams, needs only 59 yards before he cracks 1,000 on the season, and has eight touchdowns. The Utes’ balanced attack has been causing problems for teams and they look to build upon that success once they face off against the Buffs on November 26.